Driven by a racist ideology that viewed Jews as “parasitic vermin” worthy only of eradication, the Nazis implemented genocide on an unprecedented scale. All of Europe’s Jews were slated for destruction: the sick and the healthy, the rich and the poor, the religiously orthodox and converts to Christianity, the aged and the young, even infants. The Nazi persecution of Jews began in Germany in 1933. By 1939, the country’s Jews had been systematically deprived of their civil rights and property and ostracized from the national community. German conquests in Europe after 1939 led to the implementation of antisemitic policies in the occupied territories. Though the pace and severity of persecution differed in each country, Jews were marked, vilified, and segregated from their neighbors. "...HAVING TO WEAR THE YELLOW STAR WAS THE MOMENT WHEN DEEP FEAR AND MISERY FINALLY TOOK HOLD." Hitler made the decision in 1941 to carry out the systematic mass murder of Jews. Mobile killing squads followed the German army into the Soviet Union in June 1941, and by the end of the year, murdered almost 1 million Jewish men, women, and children. That December, the Chelmno killing center began operation. During 1942, the Nazis established five more death camps to carry out the gassing of Europe’s Jews. All Jews were targeted for death, but the mortality rate for children was especially high. Only 6 to 11% of Europe’s prewar Jewish population of children survived as compared with 33% of the adults. The young generally were not selected for forced labor, and the Nazis often carried out “children’s actions” to reduce the number of “useless eaters” in the ghettos. In the camps, children, the elderly, and pregnant women routinely were sent to the gas chambers immediately after arrival. Sadly, the willingness or ability of the non-Jewish populations to rescue Jewish lives never matched the Nazis’ vehement desire to destroy them. Even in countries where hatred for the German occupiers ran deep, anti-Nazism did not necessarily generate aid for Jews. The Nazis portrayed the Jews as carriers of contagion, as criminals, or as “Bolshevik” agents anxious to subvert European society. The Nazis further discouraged rescue by threatening severe penalties for those caught helping Jews. Parents, children, and rescuers faced daunting challenges once the decision was made to go into hiding. Some children could pass as non-Jews and live openly. Those who could not had to live clandestinely, often in attics or cellars. Children posing as Christians had to carefully conceal their Jewish identity from inquisitive neighbors, classmates, informers, blackmailers, and the police. Even a momentary lapse in language or behavior could expose the child, and the rescuer, to danger. Living as a non-Jew required false identity papers, which were difficult to obtain in German-occupied Europe and were subject to frequent review by the authorities. Over the course of the war, children often had to move from one refuge to another. For the children who had to leave their parents behind, the emotional pangs of separation were constant and the worries many. For Jews to pass as “Aryans,” it was essential to have false identity papers, which were often gained through contacts with the anti-Nazi resistance. Using forged or acquired papers, such as a birth or baptismal certificate, Jews sometimes could obtain legitimate documents under an assumed name from the authorities. These ruses posed great risks to the bearer since the Germans and collaborating police forces closely examined identity documents in their frequent searches for Jews, resistance members, and individuals evading conscript labor. "I HAD TO KEEP MY JEWISHNESS HIDDEN, SECRET, NEVER TO BE REVEALED ON PENALTY OF DEATH. I MISSED OUT ON MY CHILDHOOD AND THE BEST OF MY ADOLESCENT YEARS. I WAS ROBBED OF MY NAME, MY RELIGION, MY ZIONIST IDEALISM." Not all Jewish children could pass as “Aryans” and enjoy relative freedom of movement on the outside. Those who “looked Jewish,” did not speak the local language, or whose presence in a rescuer’s family raised too many questions had to be physically hidden. Children were kept in cellars and attics, where they had to keep quiet, even motionless, for hours on end. In rural areas, hidden children lived in barns, chicken coops, and forest huts. Any noise—conversation, footsteps—could arouse neighbors’ suspicion and perhaps even prompt a police raid. During bombings, Jewish children had to remain hidden, unable to flee to the safety of shelters. Under these conditions, the children often suffered from a lack of human interaction and endured boredom and fear. In a tradition dating back to the biblical patriarch Abraham, infant male Jews have been ritually circumcised as a sign of the Jewish people’s covenant with God. Even during the bleakest days of Nazi persecution, Jews tried to observe this practice. Because non-Jews in continental Europe generally were not circumcised, German and collaborationist police commonly checked males apprehended in raids. For boys attempting to hide their Jewish identity, using a public restroom or participating in sports could lead to their discovery. More rarely, they underwent painful procedures to disguise the mark of circumcision or even dressed as girls. Thousands of Jewish children survived the Holocaust because they were protected by people and institutions of other faiths. Dozens of Catholic convents in German-occupied Poland independently took in Jewish youngsters. Belgian Catholics hid hundreds of children in their homes, schools, and orphanages, and French Protestant townspeople in and around Le Chambon-sur-Lignon sheltered several thousand Jews. In Albania and Yugoslavia, some Muslim families concealed youngsters. Children quickly learned to master the prayers and rituals of their “adopted” religion in order to keep their Jewish identity hidden from even their closest friends. Many Jewish youngsters were baptized into Christianity, with or without the consent of their parents. Finding a rescuer was quite difficult, particularly one who would take care of his or her charges for a period of years. Some individuals took advantage of a persecuted family’s desperation by collecting money, then reneging on their promise of aid—or worse, turning them over to the authorities for an additional reward. More commonly, stress, anguish, and fear drove benefactors to turn out the Jewish children from their homes. Organized rescue groups frequently moved youngsters from one family or institution to another to ensure the safety of both the child and the foster parent. In the German-occupied Netherlands, Jewish children stayed in an average of more than four different places; some changed hiding places more than a dozen times. Among the most painful memories for hidden children was their separation from parents, grandparents, and siblings. For a variety of reasons—the lack of space, the inability or unwillingness of a rescuer to take in an entire family, or the decision of the parents not to abandon other family members in the ghetto—many Jewish children went into hiding alone. In France, for instance, the OSE (Oeuvre de Secours aux Enfants, “Children’s Aid Society”) was able to smuggle children, but not their parents, out of internment camps. Separation tormented both parents and children. Each feared for the other’s safety and was powerless to do anything about it. Youngster and parent often had to bear their grief in silence so as not to jeopardize the safety of the other. For many hidden children, the wartime separation became permanent. A hidden child’s safety and security demanded strict secrecy. Foster families created elaborate explanations for the presence of a new face in their home, identifying the child as a distant relative, friend, or surviving member of a bombed-out household. Convents and orphanages withheld youngsters’ Jewish identities from documents, classmates, and staff. Organized rescue groups frequently moved children around and kept records in code to prevent their charges’ discovery. In some rescue networks, parents were not permitted to contact their children or know their whereabouts. The children themselves well understood the need for security. They kept away from situations where their true identity might be exposed, held fast to their false names and religion, and avoided mannerisms or language that might be construed as “Jewish” or foreign. Jewish children who lived in hiding generally were treated well by their rescuers. But not all youngsters had such experiences. Because they could not turn to local authorities for help or were afraid of being turned out, some children had to endure physical or sexual abuse by their “protectors.” Studies conducted in the Netherlands estimate that more than 80% of the hidden children interviewed were treated well by their rescuers, while 15% were occasionally mistreated, and some 5% were treated badly. The ruthlessness of Nazi rule and the barbarities of war forced some children to mature beyond their years. One child survivor described them as “old people with children’s faces, without a trace of joy, happiness, or childish innocence.” Adapting to their abnormal circumstances, Jewish boys and girls in hiding improvised games, took advantage of the scant educational opportunities available, and eked out a precarious existence through their own labor. The daily experiences of hidden children varied, depending upon whether they could live openly and perhaps attend school and socialize with others their age, or had to be physically concealed. For those who were not permitted to journey outside, life in hiding was often filled with pain, torment, and boredom. Reading, playing, and creative expression could help to fill seemingly endless hours and temporarily divert the child’s attention from his or her desperate situation. Play is an essential part of a child’s life experience, fostering creativity, social interaction, and mental development. Even in the ghettos and concentration camps, Jewish children sought solace in games. For hidden children who often had few personal belongings, toys took on special meaning. They could help forge a bond between the children and rescuers or reaffirm a tie to their missing parents or family. Just as importantly, playthings and games helped to restore some semblance of normal childhood to youngsters living under abnormal circumstances. Jewish hidden children frequently shared in their foster families’ household chores and work responsibilities. In rural areas, they often tended animals and helped with planting and harvesting crops. In urban settings, Jewish children worked in factories or sold foodstuffs or other items on the open and black markets. In some cases, older youths fled to the forests to eke out an existence or to join the partisans in combating the Nazis. Children who went into hiding had to move quickly and inconspicuously and as a consequence, were forced to leave behind even the few possessions they owned. Most took little more than the clothes on their backs. Due to wartime shortages, obtaining new clothing was generally difficult, so rescuers made children’s clothing from scraps or dressed the youngsters in hand-me-down garments. Throughout the Holocaust, Jewish artists and writers poignantly documented their experiences in camps, ghettos, forests, and hiding places. While the opportunities and materials to express their joys, pain, longings, anger, and sorrows in literary and artistic creations were severely limited, an impressive body of work, done by adults as well as children, has survived, even if the creators did not. Though it will never be known how many Jewish children recorded their thoughts in writing, art, or music, dozens of diaries, hundreds of drawings, and some poems and songs have been preserved to provide a tiny glimpse into their personal worlds, leaving a lasting legacy of both their oppression and resilience. Jews of all ages across Europe produced thousands of paintings, drawings, and collages during the Holocaust. Works were made at the behest of Nazi overlords or initiated by relief agencies in internment camps or by Jewish functionaries in the ghettos. Many were secretly done in concentration camps. The resultant artworks reflect the Jews’ life experiences and are infused with despair, anger, or more rarely, hope. The drawings displayed here are a study in contrasts. One set of images was created by a boy living as a non-Jew in France, where he was able to sketch nature and town in situ. For the second, a girl hidden in a Lvov apartment drew from her memories or from the glimpses of life she witnessed through her window. Diaries, among the most intimate forms of writing, record innermost thoughts, hopes, fears, and aspirations. They generally are not meant for the public or prying eyes. For a hidden child, however, a diary’s personal nature presented a serious danger. A detail about one’s real family or identity could betray its author as well as his or her rescuer. While not all hidden children were able or allowed to keep diaries, those that exist offer a fascinating glance into the mind and experiences of these youths. "THEY ARE LISTENING FOR US. ... THE DOG SNIFFS AND SNIFFS AND EVEN STICKS ITS HEAD INTO OUR TENT. ... WE LIVE THROUGH HOURS OF TERROR." When the war ended in 1945, the surviving remnant of Europe’s Jews immediately began the difficult and painful search for family members. Parents sought out the children they had placed in convents, orphanages, or with foster families. Local Jewish committees in Europe tried to register the living and account for the dead. Tracing services set up by the International Red Cross and Jewish relief organizations aided the searches, but often the quests were protracted because the Nazis, the war, and the mass relocations of populations in central and eastern Europe had displaced millions of people. The quest for family was much more than a search for relatives. It often involved some traumatic soul searching for children to rediscover their true identity. Those who had been infants when they were placed into hiding had no recollection of their biological parents or knowledge of their Jewish origins. The only family that most had known was that of their rescuers. Consequently, when relatives or Jewish organizations discovered them, they were typically apprehensive and sometimes resistant to yet another change. "I HAD BEEN SEPARATED FROM MY MOTHER SO LONG THAT MOTHER DIDN’T MEAN ANYTHING TO ME." As areas were liberated from German rule, Jewish organizations rushed in to locate survivors and reunite families. 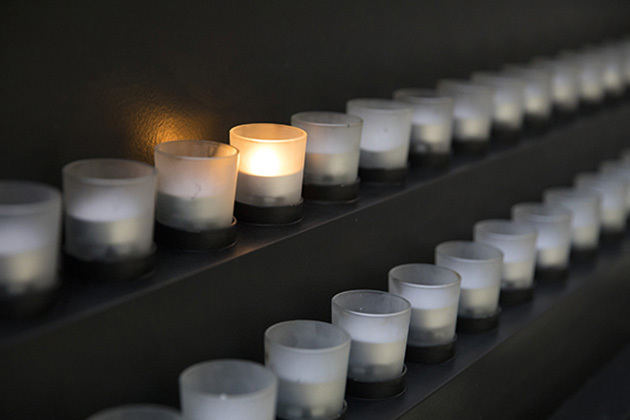 In place after place, they faced the devastation wrought by the Holocaust. In Lódz, Poland, for example, the Nazis had reduced a prewar Jewish population of more than 220,000 to less than 1,000. 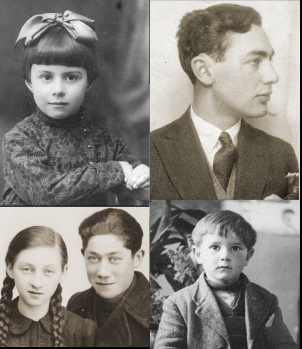 Following the war, Jewish parents often spent months and years searching for the children they had sent into hiding. In fortunate instances, they found their offspring with the original rescuer. Many, however, resorted to tracing services, newspaper notices, and survivor registries in the hope of finding their children. Time and again, the search for family ended in tragedy. For parents, it was the discovery that their child had been killed or disappeared. For hidden children, it was the revelation that there were no surviving family members to reclaim them. In hundreds of cases, rescuers refused to release hidden children to their families or Jewish organizations. Some demanded that the child be “redeemed” through financial remuneration. Others had grown attached to their charges and did not want to give them up. In the more difficult cases, courts had to decide to whom to award custody of the child. Some rescuers defied court decisions and hid the children for a second time. The future of the thousands of orphaned Jewish children became a pressing matter. In the Netherlands, more than half of the 4,000 to 6,000 surviving Jewish children were declared “war foster children” (Oorlogspleegkinderen), and most were placed under a state committee’s guardianship. The vast majority were returned to a surviving family member or a Jewish organization, but more than 300 were given to non-Jewish families. Parents, relatives, or representatives of Jewish organizations who came to reclaim the children often encountered ambivalence, antagonism, and sometimes resistance. After years of concealing their true identity, Jewishness for some hidden Jewish children had come to symbolize persecution while Christianity stood for security. Some children even repeated antisemitic phrases learned from classmates and adults. Those who had been too young to remember their parents knew only their adopted family, religion, and often nationality. Many truly loved their foster families and refused to be given into the arms of a “stranger.” In a few instances, some youngsters had to be physically taken from their foster families. For a number of hidden children, the war’s end did not bring an end to the traumatic experiences. Immediately after the war, Holocaust survivors began to document the Nazis’ crimes against the Jewish people, record their experiences, and memorialize those who were killed. The efforts were often painful journeys into the recent past. By 1948, Jewish organizations in Poland, Hungary, and Germany had compiled more than 10,000 written testimonies. Hundreds of former hidden children recounted the especially difficult pain of their survival. Many sought to recover a past that the Nazis had stolen from them—families they had never known or were only distant memories, even their own given names. Others were shocked to learn of being Jewish. By delving into the shadowy recesses of their former lives, these special survivors preserve the memory of parents who bore them, rescuers who saved them, and a time that threatened to engulf them.